Posts tagged “Remembrance of Things Tossed”. 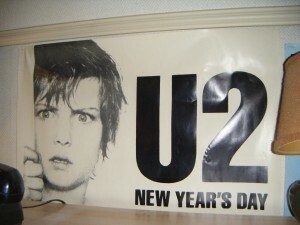 I am in the process of redecorating my old bedroom, and as much as I love this U2 poster, it needs to go. But it reminds me off that far-off time when you could actually buy a general admission ticket and join your friends at a concert. FOR TEN DOLLARS. In the summer of 1983, my friend Jeff and his girlfriend Laurie were going to see U2 and the Alarm at the pier on the Hudson. I think that pier is gone now. I wanted to join them, so I went to Mom, who worked the Ticketron counter at A&S sometimes, and she got me a ticket for ten dollars. I am still marvelling at the $10aspect. I think it was cheap even then. All I had to to was join my friends, and mind you, I got the ticket a few days before the concert. The rotting-away West Side Highway was in the background. It was the first concert of the summer, and Mayor Koch introduced the Alarm and U2 and said, “Make sure they hear you in New Jersey.” This was back when Mayor Koch was admired and his various cabinet members had not yet imploded. Remember Bess Meyerson shoplifting, and Donald Manes slitting his wrists and ankles while driving on the Grand Central Parkway? This was back when Koch was an actual Democrat. Today, he claims to be a Democrat while endorsing D’Amata, Bush, and various other embarassments. I couldn’t imagine going to a big concert anymore, partially because of the huge cost, and the rigamarole of just trying to get tickets. My next concert is probably going to be Suzanne Vega at the Landmark in Port Washington. Categories: Observations, Remembrance of Things Tossed. Tags: A&S, alarm, concert, Koch, Remembrance of Things Tossed, ticketron, U2. 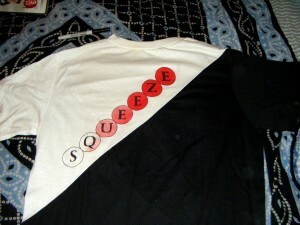 Many moons ago, I discovered the band Squeeze, and within a year, they were breaking up. The year, of course, was 1982. And of course, we all know that Squeeze broke up for about three years, and then got back together with the release of the album Cosi Fan Tutti Frutti. But in 1982, the band seemed to be history, after dismal sales of their album “Sweets from a Stranger,” an album that I always liked, btw. So, having discovered the joy of going to concerts, I went to Nassau Collisseum in November 1982, probably driven there by my friend and concertmate Ann. 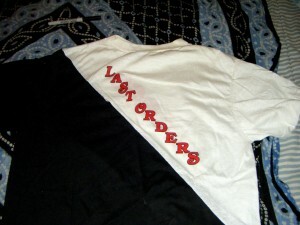 And being dutiful, I bought the t-shirt to memorialize the band’s last concert. Except that it wasn’t the last concert. The farewell urge allowed for a second goodbye concert, followed by another final concert at a festival in Jamaica, I think. But, no matter. The band was going to break up. I was just glad to have a chance to see them in concert, having just discovered them and their entire discography. There were some snotty people behind us who didn’t like the opening band, because they mumbled too much. The mumblers, were, btw, R.E.M. Then, another band took the stage, and the complainers didn’t like this band either. This band was actually breaking for good–the English Beat. Who doesn’t like the English Beat? Then, Squeeze took the stage, and the complainers didn’t seem to like them either. Why did they come? In the end, it was a pretty good show. At the time, R.E.M. was really not a known commodity. And I had the shirt to prove it. I have this blog entry under Rememberance of Things Tossed, but, it might actually be worth money, so I am looking into selling it. Anything above $20 will seem like a victory for my years of hoarding. Categories: Remembrance of Things Tossed. Tags: Remembrance of Things Tossed. 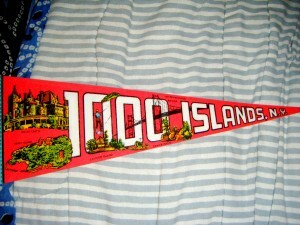 For some reason, I was overly fond of pennants, and my old room’s decor, before I slathered the walls with posters of all the new music artists I loved after graduating college, were these souvenir pennants, to show where we had gone on family vacations. I took all of the pennants down in a fit of “this is so uncool” pique in 1985, but I never tossed them out. I am now tossing them out. Photographing them is much much easier. Except for a few vintage ones made of real felt, these are a styro-board mystery, and there’s no one to donate them to. So out they will go. I posted a gallery of them on Facebook, but the one vacation we too that was very different was right before I went to college. It was less glamorous than most of our vacations–we spent a week in a cabin on a lake in the 1000 Islands area of the St. Lawrence river, suspiciously close to Canada, where they lure you in with maple syrup and then brainwash you with bilinguality and the metric system. It was not completely primitive. A TV pulled in good enough reception for me to catch my daily fix of The Edge of Night. I mean, Gunther was on the loose. I couldn’t miss a minute. I have maybe gone fishing three times in my life, and at least twice, I was the once who either caught the most, the biggest, or the only fish on the trip. My father had polio when he was six and was left only able to walk using canes. But this didn’t stop him from doing anything he really wanted to do. Sportswise, he was limited to either gambling in Vegas or Atlantic City (and never losing that much, since he was an accountant) and swimming and fishing. As a kid, Grandma hired an off-duty lifeguard to carry Dad into the water and he would scare her to death by swimming out very fa, reducing Grandma to a frantic dot on the shore, waving her hands and indicating he should head back in. It’s easy to see why Dad liked swimming so much. The combination of gravity and legs robbed of their muscles made Dad less independent than others. So being able to swim on his own must’ve been very liberating. Gambling at a craps table gave him a sense of excitement. In the late 1940s, a car with hand controls was presented as a gift by Grandpa, because Dad spent many years enduring bad treatments and pointless operations and long separations from his parents and siblings while at the hospitals, waiting for these ill-conceived but well-meant surgeries. When a surgeon in 1995 asked me if I knew why there was a leg muscle in Dad’s abdomen, I knew exactly why. Anyway, that week in 1981, we went out several times to go fishing. I know I caught at least one fish that fed us one evening–although I know very well that someone else took that fish off the hook. Late in the trip, only Dad and I went out in the small motorboat to go fishing. We were armed with a depth map of the immediate area. This let me fully utilize my cartophilia (love of maps). We went to a quiet area around one of the 1000 islands, and we waited a bit. It was later in the day–not the time you are supposed to fish. You’re supposed to fish at first light, when I am usually heading to sleep these days. At one point, there was a tug on the line. I thought it was a mistake at first, but it pulled again, and got stronger. I cannot remember which of us held the fishing pole, and which of us held the net, but a very fat, large fish soon emerged to the surface, fighting every inch of the way. Just as the net was being put under it, the fish broke the line and got free. Oddly enough, this is probably the only truly exciting anticipatory moment my father and I ever shared. That, and rushing home from Baskin Robbins to see if Ronald Reagan was going to choose Gerald Ford as his running mate (this is the last time I watched a Republican National Convention, btw). We talked about that fish for quite some time. It is probably a better story that it got away, actually. In retrospect, I can see how exciting such an event would be, if you felt you couldn’t really do everything you ever wanted. But Dad pretty much did anything we needed him to do with us. He played baseball with my brother in the backyard, and tossed frisbees to us, and quite frankly, it was a pretty normal childhood. So much emphasis is placed sometimes on what didn’t happen, instead of what did. And I sometimes wonder if Dad envied that fish, or hoped we would have caught it. I think if anyone valued the concept of independence, it was Dad. The fishing poles are still in the basement, along with the tackle box. Bought once, used for a week, spending an eternity in the basement. Categories: Observations, Remembrance of Things Tossed. Tags: 1000 Islands, Dad, fishing, grandma, independence, pennant, pseudocanadaphobia, Remembrance of Things Tossed, swimming. One day I went to high school, senior year, to find swastikas painted on the columns out front. We also were to find out that someone had scrawled “Hitler” and “Jews Rember” [sic] on the side of the school. As always, the haters are never very good spellers, are they. Great Neck by 1981 was mostly Jewish, and you would think that the non-Jews in Great Neck were pretty much used to the population shift. The haters turned out to be our age, and non Jewish. The incident ultimately led to what I called than an “all-day overreaction.” For one day in December, the entire school’s schedule was suspended for SHARE — stop hatred and respond effectively. 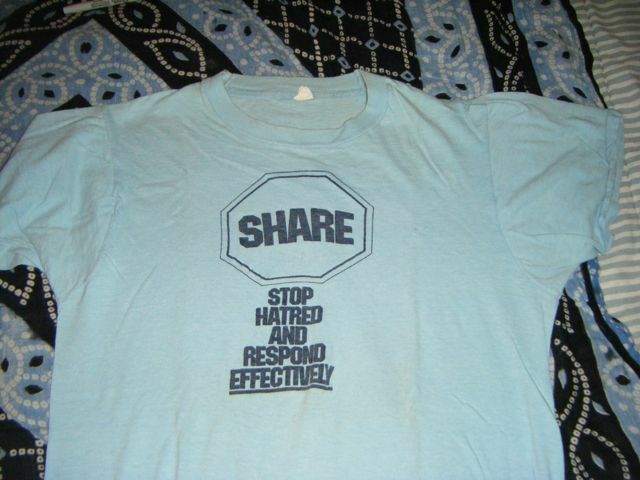 I have the SHARE t-shirt to prove it, but not for long. It’s one of the many things, one bit of the Bookey Accumulata, that I am donating to the next charity that calls and offers to swing by and take a plastic garbage bag full of stuff for their ultimate placement. I felt at the time it was an overreaction because I saw it in terms of Jews vs. non-Jews, and that with 75% or more of us in the school being Jewish, it was like preaching to the choir. Hindsight being what it is, I can see now that the point was to show all of us the irrationality of hatred and bias. The only program I remember vividly that day was a Chinese woman who worked at the United States Merchant Marine Academy. She told us about the stigma in general of being born female in a Chinese world that only valued boys. She told us how she was adopted, and therefore stigmatized further. She told us how the American-born Chinese and the China-born Chinese didn’t get along, and if you were born in a particular province in China, someone from another province or region was not too thrilled wtih you. In a nutshell, everyone hates everyone else. It was astounding, coming back to Great Neck many years later, to hear that many old-timers are not happy about the Israeli- and Iranian-born Jews “taking over” and that among the Persian Jews, the Tehrani bunch doesn’t like the other non-Tehrani Persions. But this is nothing new. In Frankfurt on the Hudson, I read how the German-born Jews were at odds with the American Jews, and how in Germany, the Landjüden (the country Jews) were mocked by the urban Jews. And of course the yekkes didn’t like the Polish Jews all that much. And over in France, most of the French hate Paris and many Parisians despise the Eiffel Tower. In Iraq, we have three groups that hate each other (Kurds, Sunni, and Shi’ites) forced into one mutual country. So after all this time, what exactly is the secret behind the message on the t-shirt? How do you stop hatred and respond effectively? By trying to like other people anyway, and going to their restaurants? I dunno, but I am glad that I live in an area where we are all thrown together anyway, and I am glad to go to H-Mart and ask some questions and deal with the notion that no one behind the cash register understands a word I am saying, and going back week after week and NOT demanding that they learn English for my benefit. I am still going to say hello to my new orthodox neighbors, even if my being dressed appropriately for summer (i.e., wearing shorts) scandalizes them. Because I am not going to change how I am for their benefit either. Oh, if only that t-shirt were magic and we could make some Lisa Simpson-style wishes and get world peace. But then Kang and Kodos would take over. Or Canada. I can just see the Mounties overtaking us and forcing the metric system down our throats once and for all. But aside from that, it might be nice. Categories: Observations, Remembrance of Things Tossed. Tags: education, hatred, Jews, racism, religion, Remembrance of Things Tossed, SHARE, tolerance. The coming out process is not one event, or a particularly focuses time, but a series of events that goes on throughout one’s gay lifetime. You think you’re out, and suddenly something pulls you back in, in some ways, into the closet. But, coming out to your parents is usually considered the biggie. 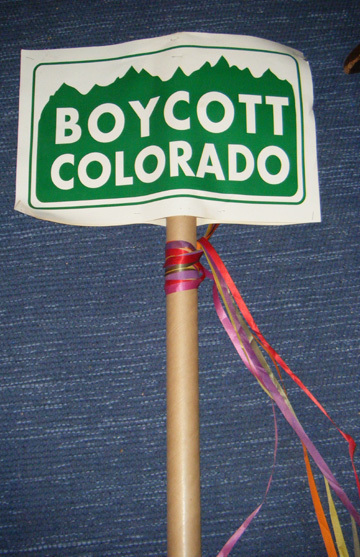 This item was something I carried in the parade–a “Boycott Colorado” banner, affixed to a hollow tube and accompanied by the appropriately gayly coloured ribbons. 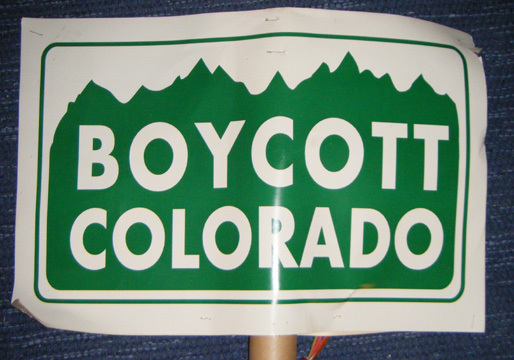 I forget exactly why, without doing research, why we were boycotting Colorado–there was an Amendment for its state constitution that was basically going to codify LGBT folks as second-class citizens. It got defeated, and I have since been to Colorado twice, and visited its Capitol. But at the time, a lot of people were just not going to go to Colorado, for business or pleasure. I think some big conferences planned not to go to Denver. More recently, I came out publicly as a gay member of the Special Libraries Association–in that I marched with the SLA in DC’s gay pride parade. And, a younger cousin of mine who recently came out (I had to find out on Facebook, btw) invited her parents along this year. Previously, only her brother had been invited along, so this was a big deal. Categories: Observations, Remembrance of Things Tossed. Tags: boycott, colorado, coming out, gay pride parade, parents, Remembrance of Things Tossed. I am photographing a lot of the stuff that I am tossing out. It’s time to get rid of some of all this stuff that’s taken over my life. So, I will immortalize the items in photographs and stories instead. You can find these stories under the subject “Rememberance of Things Tossed”–a/k/a ROTT. Categories: Observations, Remembrance of Things Tossed. Tags: accumulata, remembrance, Remembrance of Things Tossed, things.